HandsOn Connect offers different opportunity types to meet the different ways that organizations recruit and manage volunteers. Which opportunity type you create depends on how you want to recruit and manage volunteers. If you prefer to see this same material presented as a video — a video is available at the end of this article. Use this type of schedule when you need a certain number of volunteers, all of whom will be volunteering on the same date, start time and end time. You can create one or more ‘occurrences” of dates and times for this opportunity. Use this type of schedule if you need, for example, 5 volunteers on Monday from 6:00 pm - 8:00 pm, or every Monday from 6:00 - 8:00 pm. Sign up - Used with Date and Time specific schedule to automatically sign up and confirm any volunteer who meets the opportunity requirements (such as minimum age, background check required, etc). If they do not meet the restrictions, they will not be able to sign up and will receive a message saying what restrictions they have not met. When the maximum attendance for the date's occurrence is reached, volunteers have the option of joining the waitlist for that opportunity, or signing up for a different date and time of the same opportunity if it's available. Express Interest - Used with Date and Time specific schedule, this registration type allows volunteer to express interest in that occurrence, but they are not automatically confirmed. The opportunity coordinator must then review and either confirm or decline that volunteer to participate. This registration type is useful if you need to do background checks, wish to interview your volunteers or go through other processes before confirming a volunteer to participate. The volunteers initially sees the upcoming opportunity as 'pending' - and when they are confirmed for the opportunity they receive an email notification that they have been confirmed. (It's also possible to decline a volunteer if they are unsuitable for the opportunity). Use this type of schedule when you have a flexible schedule of when you need volunteers, and each volunteer may be scheduled to attend at a different date and time over an extended time period. Each volunteer for this opportunity can be scheduled to attend on a different date and time based on their availability. 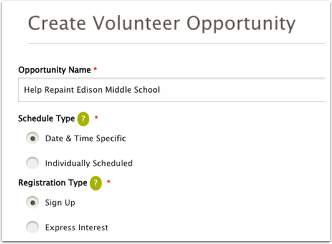 Volunteers can express interest for this opportunity as often as they like making this ideal for ongoing volunteers when scheduling can be flexible. This schedule type can also be used when you simply want volunteers to express interest, without having to specify when or where the volunteer activity will take place. 3. Express Interest with Schedule - You define a schedule of times when volunteers are needed (i.e. Mondays 9 - 5 and Fridays 9 - 12) on an ongoing basis or to a specified 'end date'. 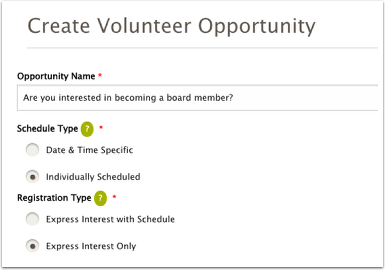 Volunteers can then express interest in the opportunity and propose one or more times they are available to attend within the schedule youve defined. The opportunity coordinator then simply confirms the volunteer if they approve the date(s) and time(s) they wish to volunteer. This allows significant flexibility in scheduling individual volunteers and works well for ongoing commitments to volunteer. 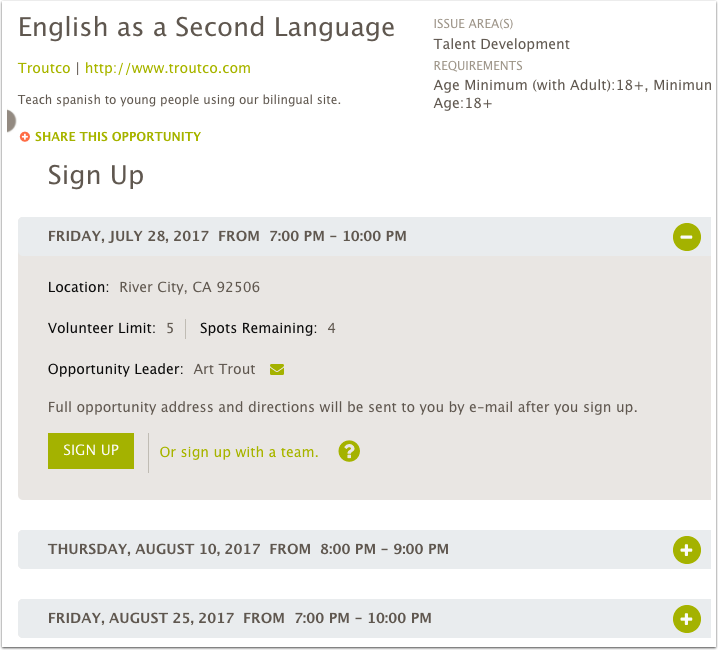 Opportunity Coordinators can also administratively schedule volunteers for one or more date & times for this ongoing opportunity. 4. 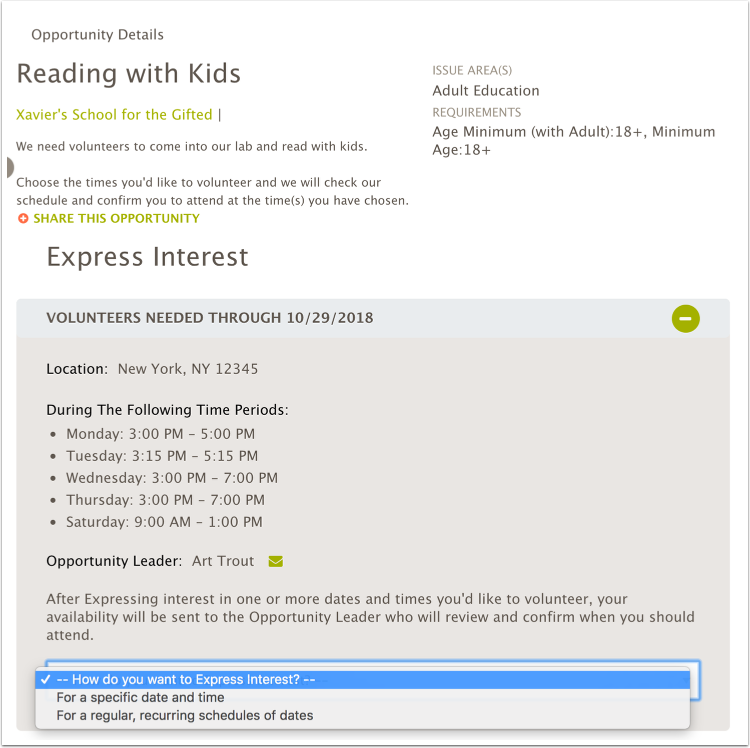 Express Interest Only - Use this schedule type when you simply want to allow a volunteer to express interest in an opportunity, without proposing when they will volunteer. Opportunities of this type do not require a location for the opportunity so it works well for virtual opportunities or expressing interest in receiving further information, joining a committee that doesn't yet have a schedule of meetings, etc. There is no need to confirm or schedule interested volunteers, though you can choose to do so administratively if you wish. This simply generates a list of interested volunteers and what you choose to do with this information is up to you. 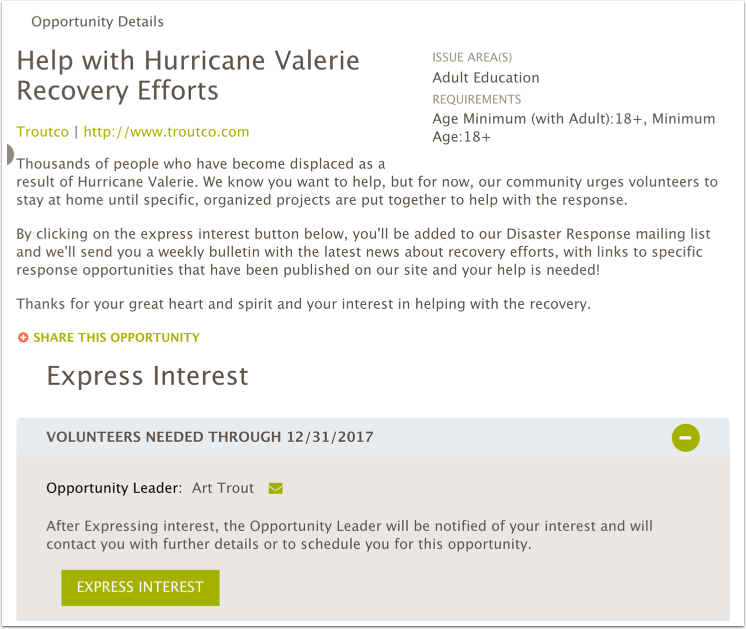 Volunteer merely express interest, and do not see it as an 'upcoming opportunity' unless you elect to schedule them for a specific time and place to volunteer. Multiple dates and times (occurrences) are shown -- the volunteer sees a 'Sign Up' button. if the opportunity is full, they see a button to join the waiting list. The time period volunteers are needed is displayed, and Volunteer can 'express interest". 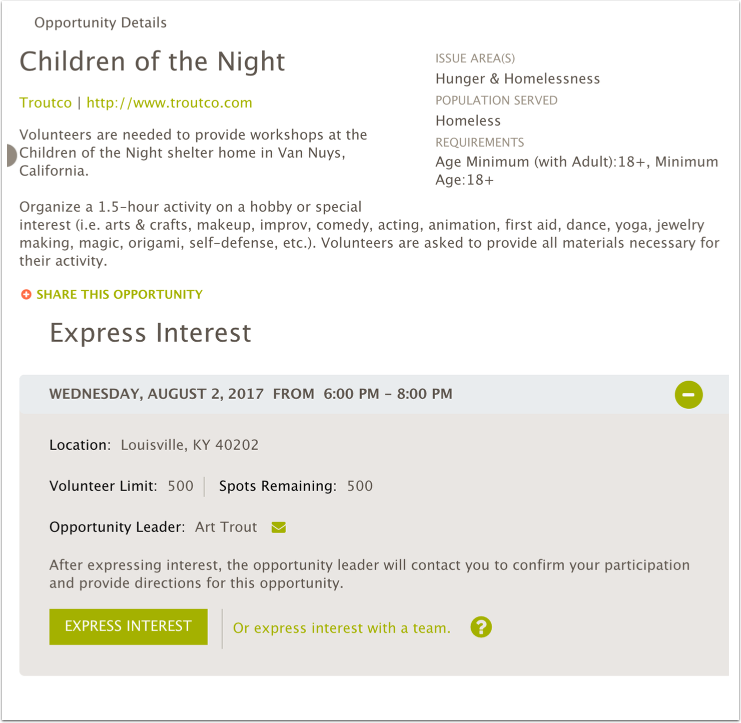 Upon clicking on the Express Interest button, they can express interest in one or more dates & times they're interested in volunteering. The Opportunity Coordinator can then review the dates they've expressed interest in volunteering, and confirm or decline them. (They also have the option of rescheduling the volunteer for one or more dates if desired). The description gives the details and tells the volunteer what to expect. The volunteer can express interest, but does not schedule themselves. The opportunity may or may not have a location. Start watching this video at 1:53 in the video timeline. What is the Partner Sharing Portal?